Commissioner for Regional Policy Corina Crețu was today in Bucharest, Romania where, in the morning, she presented the European Semester Country Report 2019 for Romania with Eugen Orlando Teodorovici, Romanian Minister of Public Finance, and Victor Micula, Romanian Secretary of State, Ministry of Foreign Affairs. In the afternoon, together with Minister for EU Funds Rovana Plumb, the Commissioner took part in a conference on “Investment priorities in Romania, 2021-2027", part of the wider discussion that the Commission launched on 27 February on investment challenges and priorities for each Member States as part of the European Semester process of economic policy coordination (see press release here). The Commission has set out first ideas as to how EU funds, in particular Cohesion Policy funds, can help achieving investment priorities in the forthcoming budget period 2021-2027. Commissioner Crețu presented the Commission's guidance on Cohesion Policy funding in Romania for 2021-2027. “With this conference, we aim to kick-start the reflection on the future Cohesion Policy programmes, to ensure a smooth transition between the EU budget periods and help Member States target investments where they are most needed,” said Commissioner Crețu ahead of her visit. 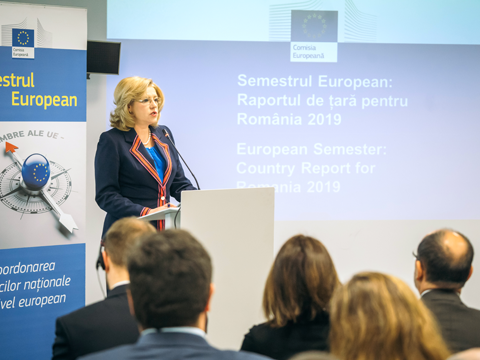 “In Romania, we particularly believe that EU funding should be focused innovation, the competitiveness of SMEs, the transition toward a low-carbon economy, strategic transport networks and social inclusion an employment measures,” Corina Crețu added. On Monday 25 March, Commissioner Crețu will be in Cluj-Napoca to speak at the COTER (Commission for Territorial Cohesion Policy and EU Budget) conference focusing on the role of local and regional authorities in Cohesion Policy. In May 2018 the Commission proposed an allocation of € 30.6 billion for Cohesion Policy investment in the context of the next long-term EU budget for 2021-2027.